Schooner wears his own doggy PFD when in the cockpit. 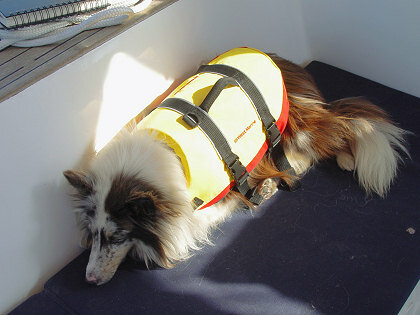 The PFD has a sturdy webbing handle in case you have to haul him up out of the water (probably by using a boat pole). There is a plastic ring for clipping a leash. When not wearing his PFD, Schooner wears a harness made of webbing, which also has a ring for clipping a leash. Click on the right-hand picture to see a bigger version; use your browser's "back" command to return here. Schooner is CiCi's dog, and the two of them normally live on CiCi's sailboat. 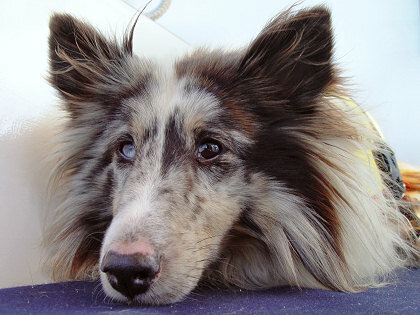 Therefore, Schooner is used to living on a boat and is used to making certain accommodations. 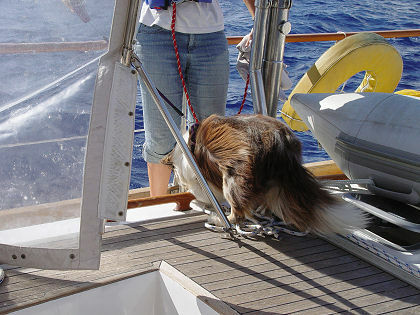 Since a shoreside walk is frequently unavailable, Schooner is trained to do his business on the foredeck, after which the "business" is cleaned up and the deck rinsed clean. 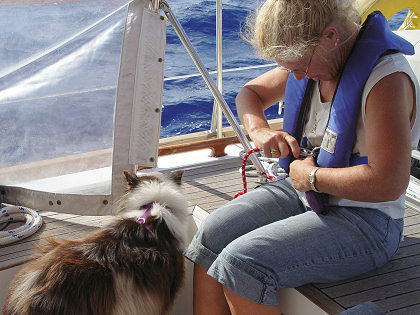 When CiCi takes Schooner for a walk to the foredeck, she first clips her harness to the jackline tether, then clips a leash to Schooner's harness. 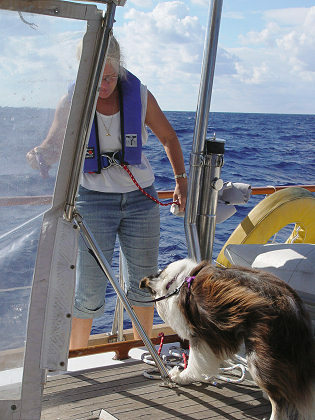 It might take a little coaxing to get Schooner to leave the cockpit, but if he has to go bad enough, he and CiCi will make their way to the foredeck. Imagine what it would be like walking around on the deck of a bouncing and rolling sailboat without hanging on to anything. When you think about it, it's got to be pretty difficult for the dog to cope with the severe motions of the boat. After all, the dog has no ability to hang on, and just uses his sense of balance to lean this way or that way to adjust to the motions. 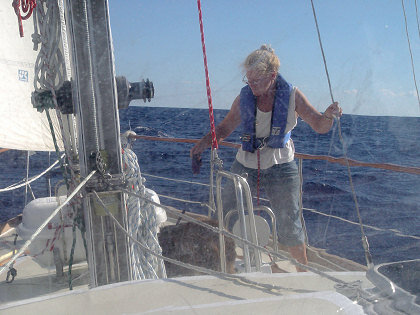 Add to that the brisk wind and occasional spray once out of the cockpit, and it's not surprising that Schooner was sometimes afraid to go to the foredeck. He understands very well that it would be easy for him to slide overboard, even though CiCi has him on a leash and is standing next to him. Taken through the dodger's plastic window. In the next section, I'll discuss our watchstanding procedures.